After the Civil War, white Confederate and Union army veterans reentered--or struggled to reenter--the lives and communities they had left behind. In Sing Not War , James Marten explores how the nineteenth century's ""Greatest Generation"" attempted to blend back into society and how their experiences were treated by non-veterans. Many soldiers, Marten reveals, had a much harder time reintegrating into their communities and returning to their civilian lives than has been previously understood. Although Civil War veterans were generally well taken care of during the Gilded Age, Marten argues that veterans lost control of their legacies, becoming best remembered as others wanted to remember them--for their service in the war and their postwar political activities. 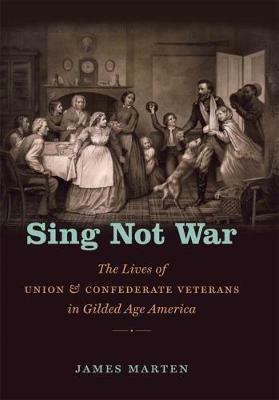 Marten finds that while southern veterans were venerated for their service to the Confederacy, Union veterans often encountered resentment and even outright hostility as they aged and made greater demands on the public purse. Drawing on letters, diaries, journals, memoirs, newspapers, and other sources, Sing Not War illustrates that during the Gilded Age ""veteran"" conjured up several conflicting images and invoked contradicting reactions. Deeply researched and vividly narrated, Marten's book counters the romanticized vision of the lives of Civil War veterans, bringing forth new information about how white veterans were treated and how they lived out their lives. |Marten explores how, after the Civil War, the white Confederate and Union army veterans reentered--or struggled to reenter--the lives and communities they had left behind. Marten's book counters the romanticized vision of the lives of Civil War veterans, bringing forth new information about how veterans were treated and how they lived out their lives.